I was lucky enough to take a tour around CCFE, home of JET and MAST, recently. In the entrance lobby they have a huge picture of the inside of JET - it is fascinating how KSTAR looks so similar and yet somewhat cleaner and more futuristic. I suppose given the physics of what is being done and the time difference in construction that shouldn't be surprising but I still found it striking. Tokamak Energy has grown significantly in terms of manpower during 2016 from ten people to thirty. Tokamak Energy is featured in a World Nuclear News article. David Kingham gives a nice summary of the short and long term plans of Tokamak Energy. It will be very interesting to see how their ST-40 spherical tokamak performs once it becomes operational later this year. A new generation high field spherical tokamak, ST40, is currently under construction at Tokamak Energy Ltd (TE). The main parameters of ST40 are: R0 = 0.4–0.6 m, A = 1.7–2.0, Ipl = 2 MA, Bt = 3 T, κ = 2.5. It will have power supplies based on ultracapacitors, liquid nitrogen-cooled copper magnets, up to 2 MW of neutral beam injected (NBI) power, and a pulse length of ∼3 s when operating at full power. To stabilize the highly elongated plasma, in addition to active vertical control, liquid nitrogen-cooled passive plates will be installed. ST40 is aimed at demonstrating burning plasma condition parameters (nTτE) and may also be suitable for DT operations in future. The main physics and engineering challenges are caused by the high toroidal field, relatively high plasma current, and wall and divertor power loads. Daniel Clery has written in Science a short (paywalled) article Private fusion machines aim to beat massive global effort covering an overview of Tokamak Energy, General Fusion and Tri Alpha Energy comparing them to ITER http://science.sciencemag.org/content/356/6336/360. Tokamak Energy has published a presentation on their plans in this PDF-document http://www.tokamakenergy.co.uk/wp-content/uploads/2017/08/Tokamak_energy-TTP.pdf. So Tokamak Energy is planning for break even by 2020. Still a while out, but AFAIK it is the closest date for Q>1 of any competitor that has been published recently. 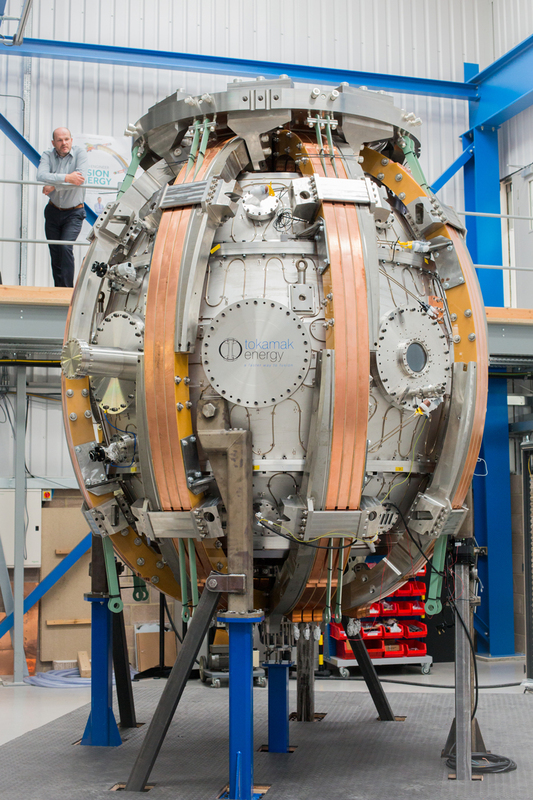 Tokamak Energy has published a set of pictures of their ST40 device as a status update. The structure of the tokamak can be seen quite nicely. Soon they will cover everything with the outer vacuum chamber and connect all services to it. https://www.tokamakenergy.co.uk/update-construction-of-st40-is-progressing-well/. More details on their future plans are available from this press release: https://www.tokamakenergy.co.uk/atkins-and-tokamak-energy-join-forces-to-plan-for-next-fusion-reactor/. In any event, all plasma work is good plasma work! Hope to see some good science as they press on. Their approach is interesting as far as Tokamaks go because they hope that their reactors can be relatively small due to the use of high temperature super conductors and spherical tokamaks instead of the more traditional shapes. I am also excited by their quite aggressive schedule. They plan to have a break even campaign in 2020.